On Earth, geologists can dig holes and pull up core samples to find out what lies beneath the surface. 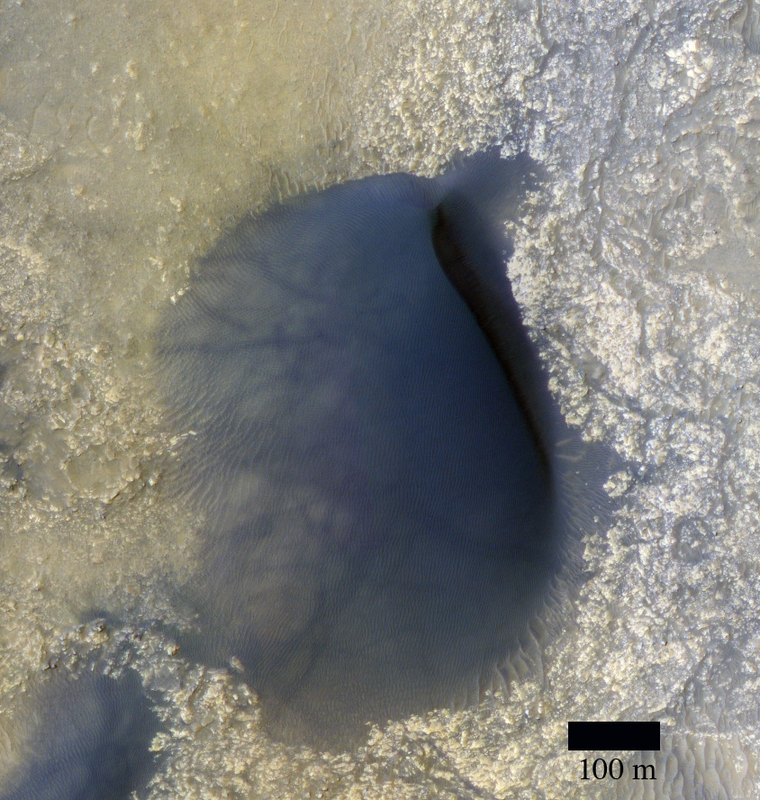 On Mars, geologists cannot dig holes very easily themselves, but a process has been occurring for billions of years that has been digging holes for them: impact cratering. Impact craters form when an asteroid, meteoroid, or comet crashes into a planet’s surface, causing an explosion. The energy of the explosion, and the resulting size of the impact crater, depends on the size and density of the impactor, as well as the properties of the surface it hits. In general, the larger and denser the impactor, the larger the crater it will form. 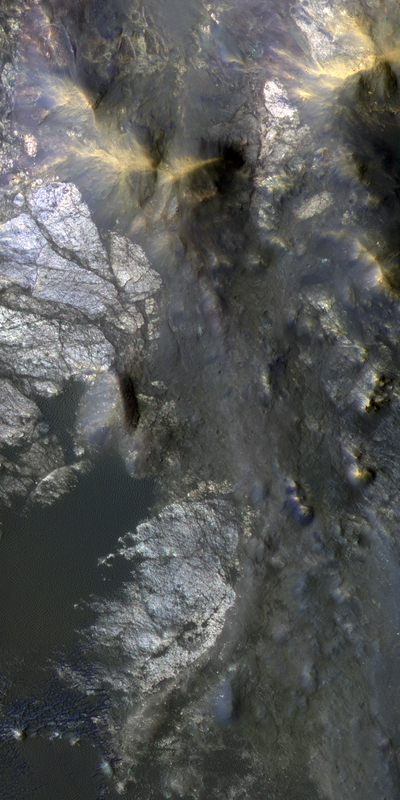 The impact crater in this image is a little less than 3 kilometers in diameter. 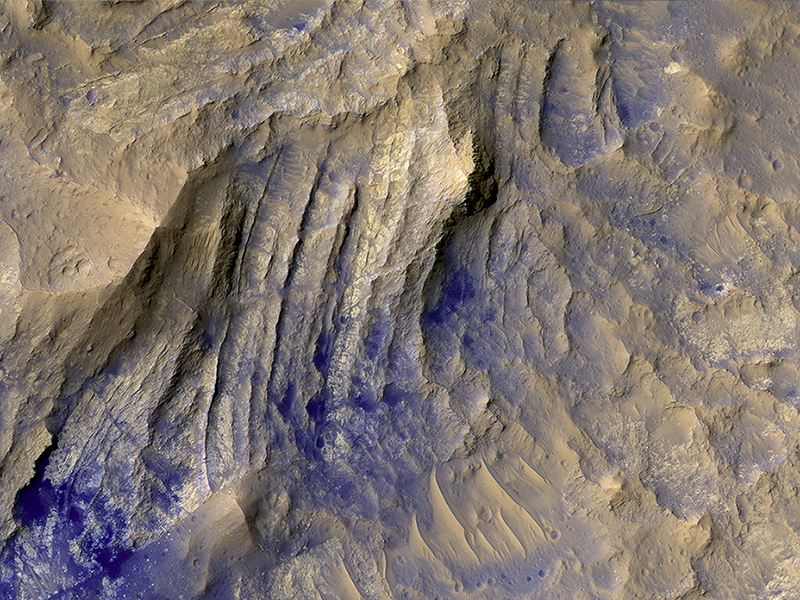 The impact revealed layers when it excavated the Martian surface. Layers can form in a variety of different ways. Multiple lava flows in one area can form stacked sequences, as can deposits from rivers or lakes. Understanding the geology around impact craters and searching for mineralogical data within their layers can help scientists on Earth better understand what the walls of impact craters on Mars expose. (Note: North is approximately down in the cutout and above image). 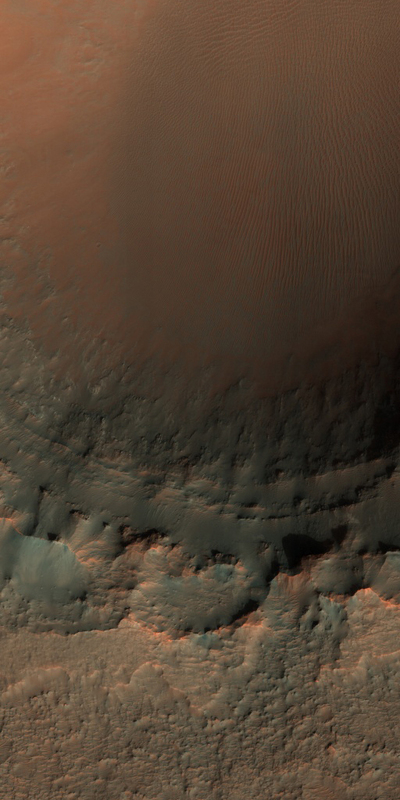 The large dark feature is a classic Martian sand dune. Most sand on Earth is made from the mineral quartz, which is white and bright. On Mars, most sand is composed of dark basalt, a volcanic rock. For this reason, dunes on Mars are darker than those on Earth. 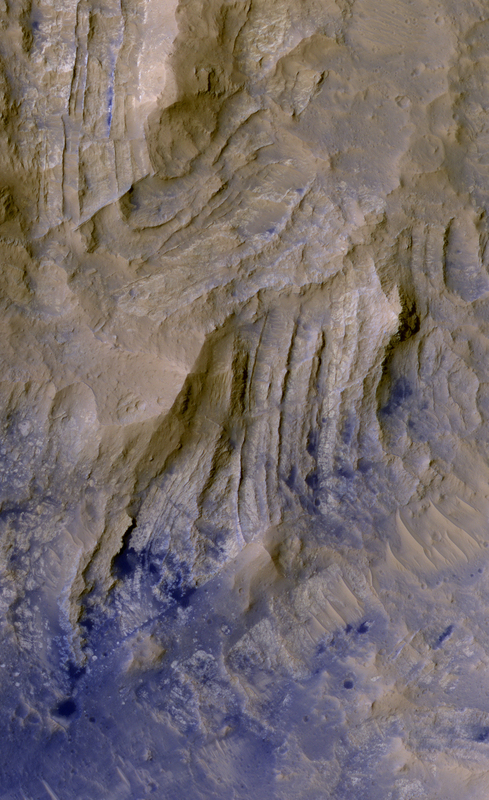 The dunes in this observation, within Wirtz Crater, are known as “barchans.” The steepest slope is on the eastern (right) side, partially in shadow, and represents the direction the dune is migrating as the sand is blown and transported by the wind. Small ripples are visible on much of the dune surface. 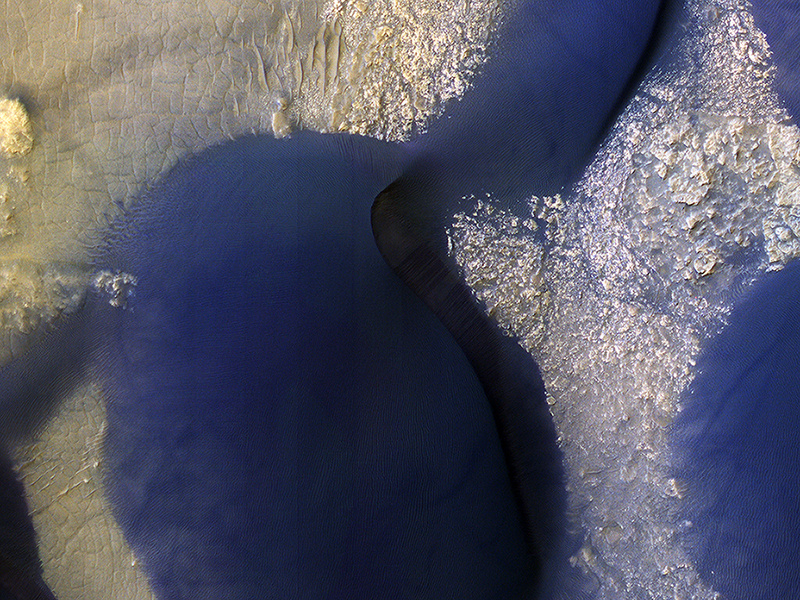 The dark streaks on the dune are tracks left by passing vortices known to us as dust devils. These raise dust off the dune, revealing a darker substrate. This is a stereo pair with ESP_021893_1315. The layered bedrock in this image was brought from several kilometers of depth during the formation of this 44 kilometer wide crater in the volcanic plains of Lunae Planum. As these layers were exhumed and brought to nearly vertical orientations, faulting and fracturing occurred and breccia dikes formed. Breccias are rocks consisting of angular and sharp fragments, and a dike is a fracture that has been widened by forces pulling apart the rock while simultaneously filling it with rocky materials. 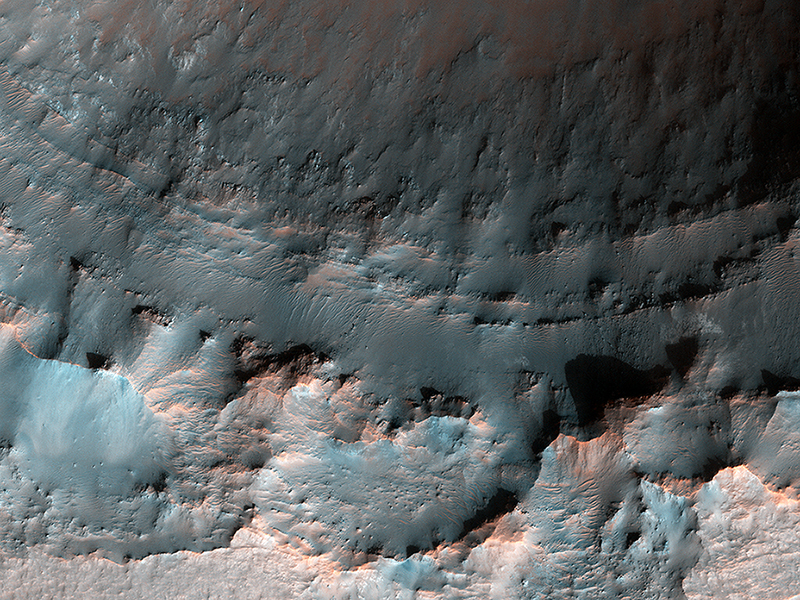 Breccia dikes are a common feature in terrestrial craters and can now be recognized in brilliant preservation on Mars. 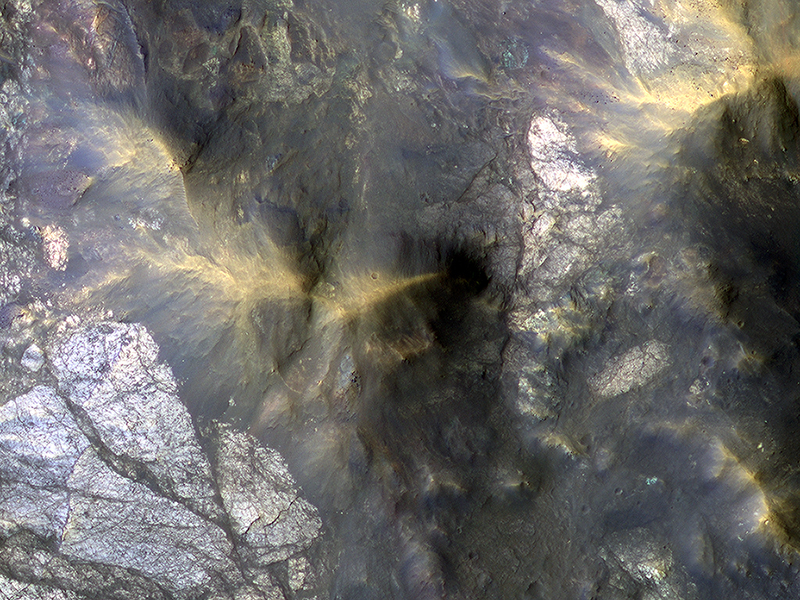 This high-resolution, false-color image cutout above allows us to see a cross-cutting breccia dike near the bottom of the image. This is a stereo pair with ESP_017055_1975.